People are always finding ways to improve the already-kinda-perfect s'more, but this version requires significantly less work than its forebearers. Sensing an opportunity to give the treat a salty, peanut-buttery edge, Oh, Sweet Basil replaced the graham crackers with pretzels and the standard Hershey's bits with a full Reese's cup. It's more chocolate and less libido-curbing crackers, which is a win for everyone. Except maybe Sylvester Graham. But he's a prude, so who cares? 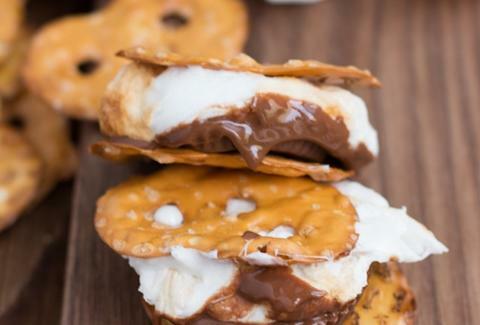 Kristin Hunt is a food/drink staff writer for Thrillist, and accepts s'mores in all their forms. Follow her at @kristin_hunt.